Our final Web Wednesday of the year is a small add on to Chrome that has come in handy more times than I can remember. I use it so much that I often forget it is not a built in feature of the browser. 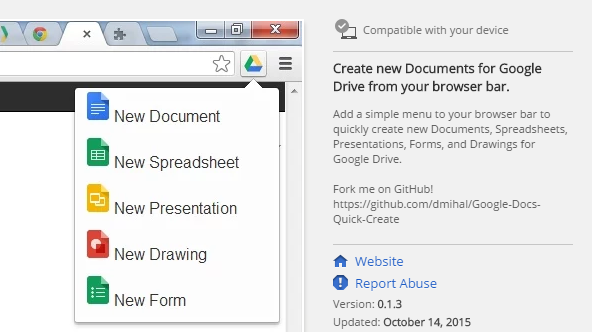 Docs Quickly add a shortcut to create a new doc, spreadsheet, presentation or drawing in the upper right hand corner of Chrome. Its not flashy, but its a huge time saver. Check it out. 2015 is coming to a close. In this weekly email, we’ve looked a quite a few websites, extensions, and tools long the way. Some of the tools we reviewed were simple, time saving apps. Others focused on assessing student knowledge in the classroom or at home when they watched an assigned video. Regardless of what the tool did, the desired outcome was that this weekly tech tip helped teachers and students use to enhance their learning experience. Got a favorite Chrome Add-On or Extension to share? Let us know here!